The underlying tomato character brings to mind a tart-tasting rye ale, with the spice tingling away like a peppery Belgian saison. Flavorful, full bodied, and fun-it’s certainly no mere gimmick and naturally goes well with a pizza. Pizza beer? Oh man, I love pizza… I love beer. There’s no way this tastes like pizza. But apparently they use the same spices as… As pizza. I mean, I love pizza, name the toppings. I like the meats, and the veggies. As a matter of fact, I really enjoy BBQ pizza. The best pizza ever is the BBQ pizza from Pizza Hut. Alright, what’s the beer smell like? Holy cow, it smells like pizza. What the heck… It literally smells like pizza. You know the smell when you walk into an Italian restaurant… Not just any Italian restaurant but the small local places owned and operated by an Italian. So if it smells like pizza, does that mean it tastes like pizza? Um… The beer tastes like pizza. No… It tastes like pizza. What in the world do they use to make this beer taste like pizza… The spices apparently. I might not order this again, unless I was ordering it with a pizza. But man, calling this a pizza beer was dead on. Sip it… Unless you like shoving a whole piece of pizza in your mouth! Well, we didn’t expect to be doing a 1001 Bottles tasting, at least not here tonight. We are sitting at Birdy’s Bar & Grill for a beer tasting with Cavalier Distributing and lucky for us, someone happened to have a bottle of one of our beers available. We didn’t have the 1001 beers book (or as we call it, the “Bible”) with us tonight, but we knew that this beer was in there because it’s so unusual that we just remembered it. I mean, it’s a pizza beer. How could you forget that? What’s a pizza beer? Well, that’s what we are about to find out. Supposedly this beer tastes just like pizza. What the heck? I’m wondering if this beer is in the book based on just originality alone, because that’s pretty darn original. Let’s check it out. When poured into a glass, the beer looks just like a regular domestic beer. It’s golden yellow, with very little head. It honestly could be Coors or Miller Lite in that glass. But then you get a whiff of it. No Miller or Coors ever smelled like that, I’m pretty sure. It really does smell like pizza. Yum! I could almost just sit here and smell it. But we need to find out if it tastes like pizza too. One quick sip, and it’s confirmed. 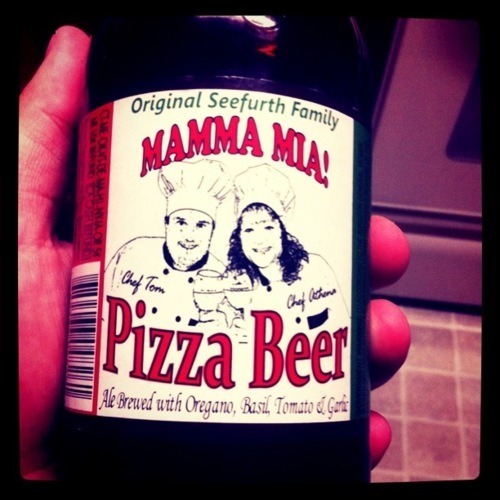 This is, indeed, worthy of being called a pizza beer. Not sure you could call it anything else. Some combinations don’t really go together, but somehow they managed to get this one right. It’s definitely worth trying if you can find some, and if I am able to grab some of this sometime while eating pizza, I will definitely have it again. Can’t imagine a better beer to eat with an Italian pie. In which Ricky acts like Larry David and I punch him. Just listen. You'll see.